How many of us knew, but perhaps have forgotten, the story of the Four Chaplains who, during the Second World War, gave up their life-jackets to other servicemen on their sinking ship, in the cold waters of the North Atlantic, on February 3, 1943 and went down with their ship - the DORCHESTER? 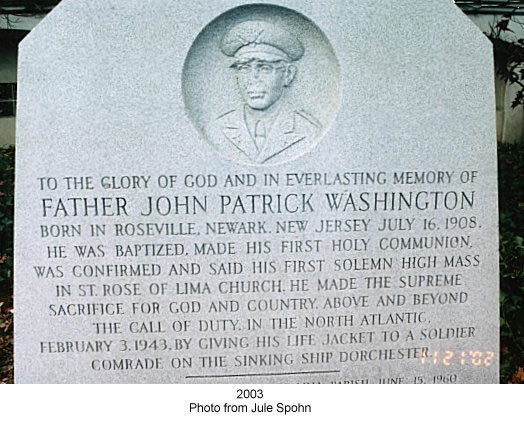 How many of us know that one of those Chaplains - Father John Patrick Washington - was from Newark? Rev. George L. Fox, a Methodist Minister, from Vermont; Rabbi Alexander Goode, from Indiana/Pennsylvania; Rev. Clark V. Poling, a Dutch Reformed Minister, from Ohio; and Father John Patrick Washington, a Catholic Priest, from Newark, met while attending the Chaplain's School at Harvard in November of 1942. After finishing school the four of them were assigned to the U.S.A.T. Dorchester, an aging, luxury coastal liner which had been converted to a troop ship. The Chaplains came on board on January 23, 1943, and became part of the 902, Merchant Marines, civilians, and your soldiers, who filled nearly every available space. On February 2nd, the Dorchester was within 150 miles of Greenland, when one of her three Coast Guard escorts and received sonar readings which indicated that a German submarine was nearby. The Captain of the ship, Hans Danielson, had instructed all on board to sleep in their clothes and life-jackets that night - just in case. However, many of those on board, ignoring the Captain's order, went to be in their underwear. Then, early in the morning of the 3rd the Dorchester had been hit "head on" by one of two torpedo's fired from the sub. A second torpedo hit immediately thereafter killing nearly 100 men in the hull of the ship and it began to sink rapidly. In the last moments of the ship's existance, while chaos swearled around them, the Chaplains began handing out life jackets to the crew who were abandoning the ship. When the Chaplains ran out of life-jackets, they took off thier own life-jackets and handed them to the crew. Together they sacrificed their last chance for survival, ensuring that at least four other soldiers would have a chance to be saved. Some of the surviving soldiers reported that as the ship was going under the water they saw the Four Chaplains, arms locked together, and holding onto the railings, praying, singing, and giving strength to the men in the water. And then, only 27 minutes after the first torpedo struck, the U.S.A.T. 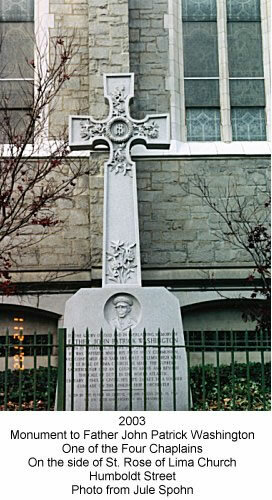 Dorchester went to her grave in the cold waters of the Atlantic, taking these four brave men down with her. Of the 920 people on board, who left New York on the Dorchester on January 23, 1943, only 230 were picked up from the icy waters by rescuers. Had it not been for the actions of the Four Chaplains in handing out the life-jackets, the toll would have been much higher. TO THE GLORY OF GOD AND IN EVERLASTING MEMORY OF FATHER JOHN PATRICK WASHINGTON, BORN IN ROSEVILLE, NEWARK, NEW JERSEY, JULY 16, 1908. HE WAS BAPTIZED, MADE HIS FIRST HOLY COMMUNION, WAS CONFIRMED, AND SAID HIS FIRST SOLEMN HIGH MASS IN ST. ROSE OF LIMA CHURCH. HE MADE THE SUPREME SACRIFICE FOR GOD AND COUNTRY, ABOVE AND BEYOND THE CALL OF DUTY, IN THE NORTH ATLANTIC, FEBRUARY 3, 1943 BY GIVING HIS LIFE JACKET TO A SOLDIER COMRADE ON THE SINKING SHIP DORCHESTER. On May 28, 1948, the United States Postal Service issued a special stamp in honor of the Four Chaplains. On July 14, 1960, by an Act of Congress, the United States authorized the "Four Chaplains Medal." The Star of David, Tablets of Moses, and Christian Cross are show in relief on the back of the medal. And at Temple University in Philadelphia they dedicated "The Chapel Of The Four Chaplains." However this Chapel no longer exists.